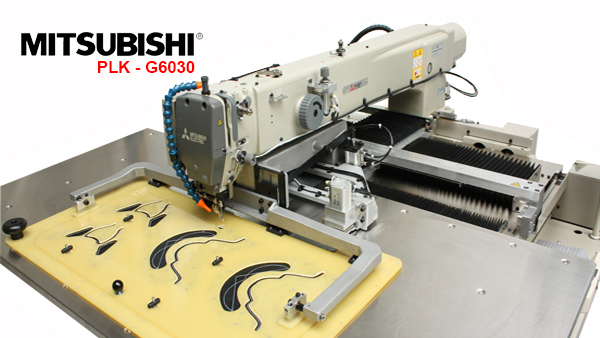 The PLK series pattern stitch machine from the Mitsubishi Japan Corporation is the latest addition to the global range of brands of stitching machines. The new partnership between Mitsubishi sewing machines and Global Industrial sewing machines, will give all our clients and dealers the chance to discover the possibilities offered by automatic sewing by Mitsubishi. Global Industrial sewing machines can supply clamps and train your staff in operating PLK series pattern stitch machine from Mitsubishi. In this way you can optimize the production line in your industry with trained personal for automated sewing machinery. Automated stitching machinery has been proven to improve production and can be implemented in many common industrial applications, ranging from: shoes, medical, safety, garments, aviation, automotive, marine and upholstery. 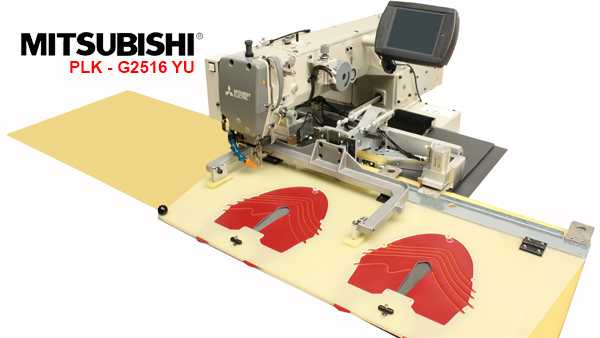 In the last 30 years Mitsubishi has built broadline pattern stitch machines in different sizes. The sizes variate from 100x100mm to 600×300 mm and with the PLK sewing machines system it can be adapted for most technical textiles. Interested in the stitching machine solutions from the partnership between Mitsubishi and Global? We are looking forward to see how we can help you in the transition to automatic stitching machines! Please contact us for more information and appointment.